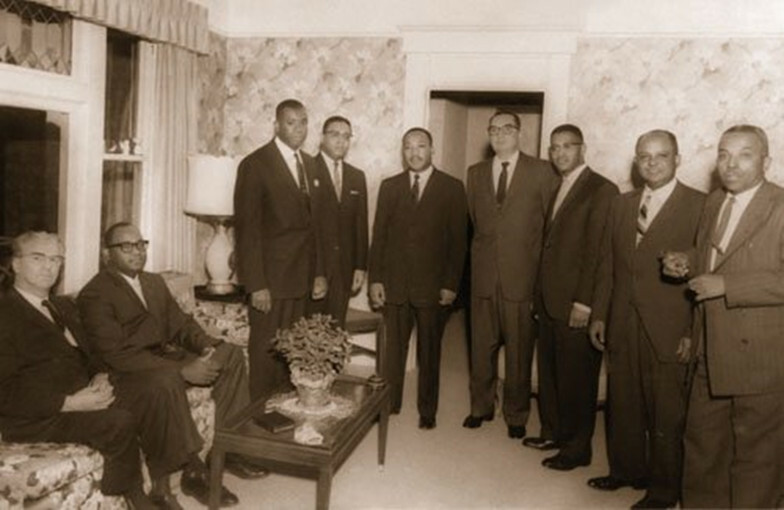 Dr. Martin Luther King Jr. at the Vancouver Ave Baptist Church in 1961. Photo courtesy Portland Observer. Overshadowed though it may be today by the Cook Street Lofts apartment complex currently under construction across the street, the Vancouver Avenue Baptist Church (3138 N Vancouver Avenue) is an institution of the Eliot neighborhood and of African American history in Portland . The Church appears similar to most others across Portland, with a brick facade, stained glass windows, and a mid-sized wooden steeple. However, it is one of the few remaining structures from Vancouver Avenue in the 1950s, and a link to the era when the area was known as “Black Broadway”: the hub of African American life and culture in Portland. Redevelopment in the 1960s–including the construction of the I-5 trench, the Emanuel Legacy Hospital, and the Coliseum–spelled disaster for the black community in North Portland, and modern construction threatens the few structures that have survived thus far. As one of the last standing monuments to Portland’s African American community in the 1940s and 1950s, the story of the Vancouver Avenue Baptist Church is a vital thread in the tapestry of Eliot’s past. The Church’s roots, like many Albina institutions, began with the “Kaiser Caravans” that brought thousands of shipyard workers to the Northwest during World War II. Most of these new arrivals were Southern, many were black, and as these migrants settled into their new homes in Portland, the Northwest received an injection of Southern culture. For the first time, barbeque, jazz music, and, of course, Southern Baptism thrived in Oregon and Washington. The Church itself originally formed in 1944 in a shipyard worker’s housing project in Vancouver called Burton Homes. One year later, it had a new leader who would prove to be the driving force behind the Church’s whole story: the Reverend Oliver Booker “O.B.” Williams. Under Rev. Williams and his wife Willa Ida Jackson-Williams, the next decade saw the Church relocate no fewer than six times. As World War II ended, the housing projects closed, and the Church moved into Albina in 1946. In Portland, the congregation quickly outgrew each new space they moved into, even renovating a condemned structure in 1947, only to find that they were too large for it by the time they had finished. The Vancouver Avenue Baptist Church finally moved into its current location in 1951: a Lutheran church built in 1909 that could hold 600 people. Even this was eventually found to be inadequate, and in 1958 Rev. Williams renovated the space to hold 800, making his the largest African American congregation in the Northwest. The Church’s most famous moment came in 1961. As a central pillar of Portland’s black community, the Urban League selected it as one of the stops on Rev. Martin Luther King Jr’s national speaking tour. He met with the clergy and delivered a speech entitled “The Future of Integration” to the congregation, commenting that “if democracy is to live, segregation must die. Segregation is a cancer in the body of democracy that must be removed if the health of the nation is to survive.” Albina–still a heavily segregated neighborhood in the 1960s, and just beginning to feel the Civil Rights Movement’s arrival in Portland–must have felt the weight of King’s words. Alongside the rest of Eliot, the Church saw most of its community displaced over the next decade, and today its congregation is a fraction of its old size. Now flanked by redevelopment along Vancouver and Williams Avenue, its continued existence is under constant threat. The Vancouver Avenue Baptist Church still stands as a direct line from the present back to the old Albina of the 1940s and 50s, but, like many other historic institutions, could fall victim to the waves of demolition across North Portland.